Recognizing that a pattern is recognizable does not imply that the total potential meaning can be understood. In my view, a computer is a collection of processes which make sense only in the micro, immediate sense, and in the abstract arithmetic sense, but not in the senses which a living organism accumulates through thousands of lifetimes of experience and culture. There seems to be a lot of confusion resulting from Claude Shannon’s use of the term entropy, and conflating it with thermodynamic entropy. I maintain that Shannon Entropy™ is closer to the inverse of thermodynamic entropy than it is a synonym for it. From what I understand, Shannon entropy is the dissipation of information processing efficiency in the context of data compression, not a general property that relates to physical materials involved. If information is highly compressible, ie, 10,000 zeros in a row, then it has a very low Shannon entropy – it is easy to compress, and not a lot of *extra* information needs to be sent on top of the text to allow the text to be reconstituted on the other end. This is almost the opposite of thermodynamic entropy, in which a box of half hot coals and half ice cubes has lower entropy than that same box when it has reached equilibrium as warm coal mud. The uniform distribution of warmth gives it higher physical entropy, because, in this case, it would be harder to do work with the energy going on in the mud when it has already reached an equilibrium within its closed system. I could be wrong about this but I think I have it straight. If we throw in QM and get a whole other idea of information and physics, where physics itself is pure information. I sympathize with the effort to unify under something like pattern or information, but ultimately it fails to explain how or why information would make up its mind to pretend to be the universe. It’s kind of a mess, and I think it takes us away from the more relevant issue of information’s direct relation to consciousness (sense) and consciousness’s direct relation to physics (motive). When you put a subject in the mix, there is a body of semiotic work to approach it with – semantics, syntactics, and pragmatics. 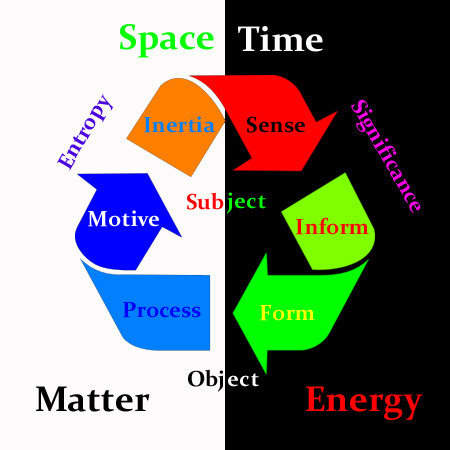 Trying to link ‘information’ with physics directly I think destroys any possibility of understanding awareness. It is like trying to build a car out of exhaust. The Extreme Physical Information (EPI) principle builds on the well known idea that the observation of a “source” phenomenon is never completely accurate. That is, information present in the source is inevitably lost when observing the source. Information is not passively received by an observer but rather an observer is informed by mutual collaboration on multiple levels with the source. Since we can only be sure of how it feels to be informed as a human being, we cannot speculate meaningfully on non-human semantic observers. Non-human observers presumably have fewer levels of senory-motive collaboration. The human experience of being informed occurs on multiple levels or castes, which can be modeled in a hierarchy or holarchy from low level or bottom up phenomena such as physical and chemical interaction, to high level or top down phenomenology such as cultural or creative insights. Multisense Realism suggests the interior/external symmetry of each layer (‘horizontal’ interaction) is such that it can be described externally as objects in space, and internally is subjects through time. What EPI considers a loss of information from source to observer, MR considers a refraction of sensation such that rather than a net loss of information, there is a qualitative enhancement on the observer end. The less horizontally complete the information received from the source, the more vertically rich the observer’s contribution to their sensation will be. This principle of subject-object qualia-quanta fungibility I think may be novel and experimentally discoverable property. We can see it informally ourselves. The role that mystery plays in fantasy and perception. The banality of purely literal expressions. The more there is to know about the source that the observer is uncertain about, the more the observer can generate enthusiasm and fertile subjectivity. As the observer’s personal contribution to the sensation-observation increases, the supposed EPI loss of (horizontal) source information into a gain of (vertical) observer qualia and conserving the equilibrium significance of the sensation/observation as a whole. Thus, the more complete the information we already have of an external object, the less we can subjectively invest in it. To understand the world of objects, we have to ‘go horizontal’ and flatten our subjective imagination to an impersonal, generic, and universal mode. MR posits that information transfer is entirely dependent on sense, which is an internal, semantic, essential property of the cosmos. Not ‘a’ process, but the only process, which gives rise to all second order logic like sequence, identity, symmetry, mind, and time. Computation is the flattest sensation; a 100% non-mysterious, horizontal movement or replication of low caste sense so that it is literal, discrete, digital, and a-signifying. Pure quanta has no sense to it other than vectors in ‘computational space’. It is no different here or there, close or far, mine or yours. Consciousness is the deepest ‘container’ of sense within sense; a 100% mysterious, vertical range of stillness or uniqueness. A source* of genuine high caste motive-will that is figurative, compact, analog-synthetic, and semantic. Pure consciousness has no computation to it other than an inferred invariance of awareness through time. It is proprietary and defined precisely by it’s capacity to discriminate mine and yours, before and after, high and low, etc. *see etymological relatives: soul, solitude, solitary, solace, solemn, solar, self, soleil/sun/solar, isolated, solution, insoluble, solid, consolation, stand, stable, static, stasis, sol, whole, holistic. 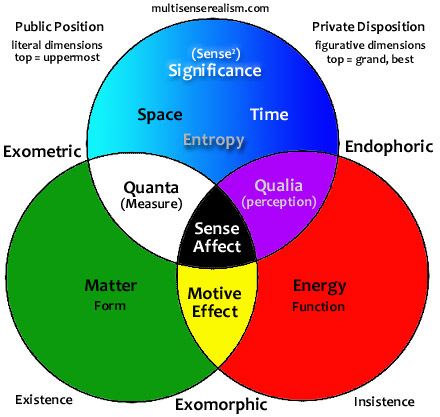 Multisense Realism model discerns between measurements and perceptions. Perceptions are informed by other perceptions, information does not perceive and nothing is informed without sense on some level. Breaking down information into its realistic constituents, inform and formation, where informing is to decode meaning or receive semantic value and formation is to encode for semiotic expression. The breaking of information into inform and form as stages within the cycle of perspective transformation parallels the breaking of spacetime into Space and Time (really Spacetime and Timespace, but this is crazy looking enough as it is) and Matter and Energy. I use the term Process to denote serial and parallel arrangements of encoded forms into process protocols, as the processor motive executes them as object transformations or changes to states of material inertia across space. The cycle begins and ends with sense – the initiation of experience or afferent input. As usual with these syzygy diagrams, all of the derived symmetries and cyclic phases are meaningful. Entropy opposes Form, Significance opposes Process, Subject and object are to significance and entropy are to matter and energy and spacetime, etc. The curved arrows here are useful to connote the inside-outside topological involution throughout.